My goodness, where did June go to and now here we are half way through July. 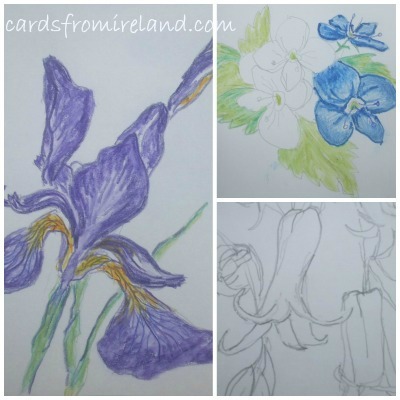 June was a very busy time with visitors and starting new wild flower designs, sketches mostly. I am keen to get more done before they all finish flowering. The bog cotton is in full glory now across our bog, a white billowy sheet spreads it's self over the peat and grass. Must get on the bike and get some sketching done in situ while this glorious summer weather is upon us. Never had such a good summer since I arrived in Ireland, long may it last!! Here is a little preview of some of my sketches in preparation for painting. So folks, my time has been filled as well with preparing my new Mayo Print Collection for the launch of Craftworks Mayo's Gathering Collection which was held on 11th July in Claremorris Gallery. It was a great night, full of people in good spirits and no, not just from the wine! There were 28 pieces of lovely craft on view and they are now in our new brochure too. We also have a new website www.craftworksmayo.ie where our work is on display and can soon to be bought from there. I have just today put my Mayo Print Collection onto this website, so do go and have a look! More news re Craftworks Mayo, another event coming up at The Museumof Country Life at Turlough, Castlebar on 3rd and 4th August where lots of crafts will be on show and demonstrated. Will post another rambling before long with some more interesting bits and bobs. So thats all for now folks! !